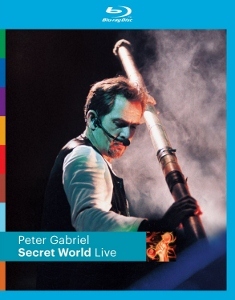 Article first published as Music Blu-ray Review: Peter Gabriel – Secret World Live on Blogcritics. Elaborately staged and choreographed, Peter Gabriel’s 1994 Secret World Live captures the artist at a dramatic peak in his career. Filmed over two nights in Modena, Italy, Gabriel was touring in support of his platinum-certified 1992 album Us. The 102 minute concert video won a Grammy for Best Music Video – Long Form. Eagle Rock Entertainment has reissued it with restored visuals and remixed audio. The results are impressive, particularly in terms of the DTS-HD 5.1 soundtrack. Of note is the presence of Paula Cole, of “I Don’t Want to Wait’ and “Where Have All the Cowboys Gone?” fame, as an additional vocalist. Beyond the superbly performed music, Robert Lepage’s staging keeps the concert visually interesting. The film’s director, François Girard, maintains an unflashy visual tone that puts the focus squarely on the musicians on stage, rather than audience reactions. The fact that the concert takes place primarily on a round island section, connected to the main stage by a long catwalk, allows for considerable visual variety. “Come Talk to Me” opens the show with Gabriel inside a phone booth, emerging to play tug of war with the cord. “Across the River” finds Gabriel using a gigantic oar, pictured on the Blu-ray cover, to mimic rowing a boat. There’s a conveyer belt built into the catwalk that is used to good effect here, carrying he and his musicians across the stage. Sometimes the carefully planned dance routines are maybe just a little too stagey, such as the hokey moves Gabriel goes through during “San Jacinto.” But for the most part, a nice balance is struck between the more serious moments and the bouncy abandon of songs like “Kiss That Frog” and “Shaking the Tree.” Of course, Gabriel predictably brings down the house with hits such as “Solsbury Hill” and “Sledgehammer,” both fun moments late in the show. At 25 years old, Paula Cole was still a couple years away from her big hits. She is featured prominently throughout, fulfilling far more than merely the role of backup singer. “Come Talk to Me” and especially “Don’t Give Up” are duets between she and Gabriel. Not only does she sound terrific, she’s gorgeous as well, providing a very welcome visual counterpoint to Gabriel’s ridiculously tight trousers. Speaking of unwanted visuals, I’m not convinced that attaching a video camera to Gabriel’s head during “Digging in the Dirt” was such a good idea either. I don’t feel any particular need see the inside of his mouth, but there it is nonetheless. A lengthy, joyous version of “In Your Eyes” closes the show, with Gabriel, Cole, and other band members jumping rhythmically around the stage, creating an infectious feeling of celebration. As the song fades, Levon Minassian finishes the concert alone with a haunting doudouk solo. In an era when many concerts were being taped on standard definition video, Secret World Live was shot on 16mm film. The original negatives were restored and given a 1080i, AVC-encoded transfer. Apparently a great deal of work went into getting the footage to look as good as it does, but there are definitely some limitations to the image quality. The main issue is a generally soft picture, especially the wide shots. There’s a shot at the end of “Sledgehammer” that looks downright horrible, pixilated and blurry. In fact, that shot and a few others look like they were shot on video, though these moments are very brief. Once you get used to the hazy look and lack of detail, it’s definitely watchable. On the other hand, the DTS-HD Master Audio 5.1 sounds fantastic. The mix allows every component of the band to be heard distinctly, with Gabriel and Cole’s vocals out front. The audience is definitely audible, but wisely the cheering and whistling has been relegated to the surround channels. The drums of Manu Katche are dynamic, keeping the LFE channel active. The epic feel of Gabriel’s music is well represented by both the DTS track and the LPCM 2.0 stereo that’s included as an alternative. A handful of extras supplement the main program, including a bonus track from the concert, “Red Rain.” A behind-the-scenes featurette runs about 15 minutes and is mostly an interview with Gabriel about the visual concept for the concert. “Timelapse” is a few minutes of time-lapse footage of the crew assembling the stage. “Quiet Steam Gallery” is a six minute still photo slideshow set to a remixed version of “Steam.” Lastly, there’s a bit of cross promotion with the inclusion of “The Rhythm of the Heat” that’s taken from the 2011 New Blood: Live in London Blu-ray, also available from Eagle Rock Entertainment.